When The Blue Business℠ Plus Credit Card from American Express marketing materials say the card will "fuel your vision," they're not kidding around (American Express is a CardRatings advertiser). With two-times the points on your purchases up to $50,000 spent per calendar year, small business owners could see a huge return on their spending power. And there's no annual fee to offset (Terms apply. See Rates and Fees). Perhaps the one thing that sets The Blue Business℠ Plus Credit Card from American Express apart from its competitors the most, however, is the ability to spend above your credit limit (with certain terms and regulations, of course) and still earn rewards on those purchases. The flexibility that this affords small business owners is among the top reasons you should consider adding this card to your wallet if you're a small business owner. With no annual fee and an intro 0 percent interest on purchases and balance transfers for 12 months (then, 15.49% - 21.49% Variable), this card can help small business owners buy the things they need without additional fees that sometimes accompany other banks' terms (See Rates and Fees). Plus, with The Blue Business℠ Plus Credit Card from American Express, the perks for customer loyalty do not end after the introductory 12 months (keep reading to learn more). Earn two-times the points on your first $50,000 in purchases annually. Take advantage of an introductory 12 months of zero interest on purchases and balance transfers (15.49% - 21.49% Variable after that; See Rates and Fees). You'll earn points on purchases made above your credit limit, giving you earning power and flexibility (buying above your limit isn't unlimited; it's based on your payment history and other factors). If you routinely spend disproportionately in particular categories, you might be better served with a card that rewards purchases in those categories with a higher rewards-earning rate. Trust – it's among the top things The Blue Business℠ Plus Credit Card from American Express is selling to its cardholders. With its flexibility to spend above your credit limit, American Express is choosing to trust its members. The amount you're allowed to spend above, while not set in stone and subject to your credit rating, payment history, and other terms, not only allows you to purchase necessary items or services for your small- to mid-size business, it also allows you to earn rewards on it. Talk about customer appreciation. And have we mentioned this card doesn't charge an annual fee? The rewards you can earn based on your spending are also worth noting. There are no categories rotating month-to-month, so you have a bit less to think about when it comes to making the most of your business' credit card rewards earning, but you also have the opportunity to earn more than the typical flat-rate rewards card. Here's the deal (and, by the way, this is what we were talking about earlier when we mentioned rewarding your loyalty): On the first $50,000 spent each calendar year, you'll earn two times the Membership Rewards® points on all your purchases. After that first $50k you'll earn one point per $1 spent. You know, welcome offers are great, but they're kind of a one-time deal. With The Blue Business℠ Plus Credit Card from American Express, you'll basically be getting a "welcome to a new year" opportunity to earn every year. For small business owners looking to make some big purchases and pay interest-free over time or just to rack up rewards for regular business purchases, this card could be an excellent tool in helping you achieve business success. Although the introductory 0 percent period is nice, don't let it lull you to sleep so much that you allow your balance to grow unchecked. You'll want to make a plan to pay off the balance before the intro period ends. Additionally, while the opportunity to earn two times the Membership Rewards® points on the first $50,000 spent annually is nice, if you know you'll spend well above that each year you could likely earn more rewards with a card that offers a higher spending cap for its highest rewards (that said, you'll probably pay an annual fee for those cards). Additionally, if you spend more in specific categories, you won't be rewarded with The Blue Business℠ Plus Credit Card from American Express as much as you would with another card that offers higher rewards in particular categories. Earn 2X Membership Rewards® points on everyday business purchases such as office supplies or client dinners. 2X applies to the first $50,000 in purchases per year, 1 point per dollar thereafter. Like The Blue Business℠ Plus Credit Card from American Express, Capital One® Spark® Cash Select for Business requires no annual fee; however, unlike The Blue Business℠ Plus Credit Card from American Express, Capital One® Spark® Cash Select for Business offers a one-time $200 cash-back reward after you spend your first $3,000 within three months of opening your account. Neither card limits you to spending categories just to earn rewards, and neither card lets your rewards expire (as long as your account remains open). The $200 bonus offered by Capital One® Spark® Cash Select for Business is enticing, and, long-term you might earn more with this card since it offers a flat 1.5 percent cash back on all your purchases. Sure, you earn 2 percent back on the first $50,000 you spend each year on the American Express card, but that drops to 1 percent after that initial spend each year. If your business routinely spends well above the $50k threshold, you just might realize greater cash back with Capital One® Spark® Cash Select for Business. 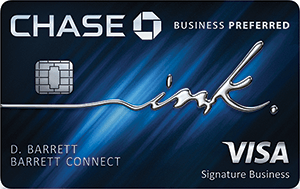 If you know you're going to spend a large amount in the first year with your new card, you'd be wise to explore the Ink Business Cash℠ Credit Card instead of The Blue Business℠ Plus Credit Card from American Express. 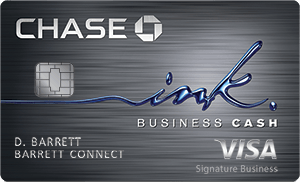 The Ink Business Cash℠ Credit Card from Chase allows you to earn 5 percent cash back on the first $25,000 spent in combined purchases at office supply stores and on cellular phone, landline, internet and cable TV services each account anniversary year (then, 1 percent). Plus, you'll earn 2 percent cash back on the first $25,000 spent in combined purchases at gas stations and restaurants each account anniversary year (then, 1 percent), and 1 percent on all your other purchases. The Ink Business Cash℠ Credit Card also offers a $500 cash bonus after you spend $3,000 in the first three months with your card, and there's no annual fee to worry about. First of all, you can earn 5 percent back on your wireless phone purchases with U.S. providers and on your U.S. office supply stores (up to the first $50,000 spent annually). You'll also earn 3 percent back on a category of your choosing from this list: airfare; hotel stays; car rentals from select companies; purchases at U.S. gas stations; purchases at U.S. restaurants; U.S. advertising; U.S. shipping; and U.S. computer-related purchases (up to $50,000 spent annually). At last, you'll earn 1 percent back on all your other purchases. In other words, there's a lot of earning potential with the SimplyCash® Plus Business Credit Card from American Express, but you do have to ensure that you actually spend in the bonus categories in order to make this card work for you. Furthermore, this card does require you to keep up with categories and caps – if you'd prefer simpler earning structures, The Blue Business℠ Plus Credit Card from American Express could be a better choice. The Blue Business℠ Plus Credit Card from American Express is the perfect card for small business owners who want cash back as well as simplicity. With allowed spending above your credit limit, you have the flexibility you need to make decisions on the go for your business. The new entrepreneur or small business owner could find this card fits perfectly with their needs.